H.264 is an incredibly popular codec that forms the basis of most online video shown today. But H. 265 codec video is trending to exceed H.264/AVC codec video. H.265, or High Efficiency Video Coding, is a new video coding standard that can encode video with the same video quality as H.264 video but only with half the size of the same H.264 video. As x265 grows in popularity, however, home users will start to use the new HEVC codec to encode their video files to reduce file sizes and decrease upload times. But on the other hand, although HEVC is more and more popular, some devices still don’t support it. If you want to play H.265/HEVC video files on these devices, you need to decode H.265 to H.264 files. All the need urged the development of H.265 Decoders and Encoders. After did a online research, we rounded up best 5 x265 video converter applications so far on the market to help you transcode H.265 video to H.264 and encode H.264 video to H.265. Before the reviews, you maybe interested that which devices of you support H.265 and can’t play H.265. Below are the best 3 H.265 video converter applications after we tested the video output quality, video conversion speed and output formats. With them, you can easily convert H.265 video to TV, Xbox One, Apple TV, WMP, etc or re-encode H.264 video to H.265 files to reduce video size. You can click the name to learn its review and the user guide. 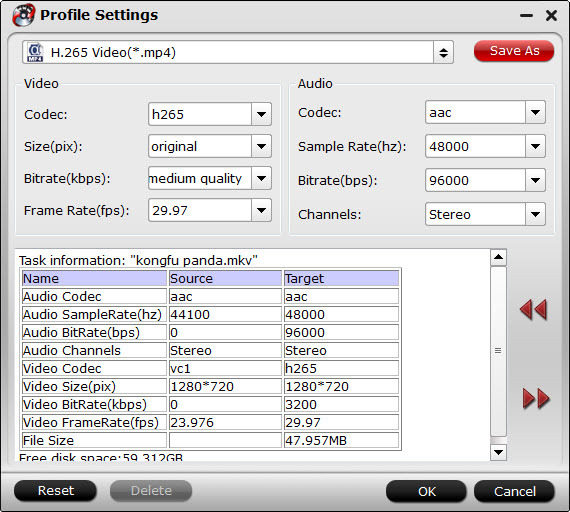 Pavtube Video Converter Ultimate is designed to handle the H.265 format like a boss. The great thing about this tool is that it combines encoding, decoding, and converting into one piece of software, which may save you some valuable time based on your goals (plus it has big, easy buttons for amateurs). With it you can easily transcode video content, upconvert older HD video to the new format, or downsize larger videos without a loss of quality. The program is primarily designed for BD/DVD/video movies, and while it does have trim, crop, split, and merge functions, you will not be able to customize it to your specific situation. Decoding H.265/HEVC videos to other video format like H.265 MP4, H.264 MP4, Xvid, Divx, AVI, MOV, M4V, MKV, WMV, MPG, etc. or directly convert H.265 video to audio format like MP3, WAV, AAC, WMA, Apple Lossless, AIFF, FLAC, RA, AU, DTS and etc. Please note that Pavtube Video Converter Ultimate is designed for Windows use specifically. If you are runing MacOS Sierra, please use the equivalent Pavtube iMedia Converter for Mac. Just come to the output list, in ‘HD Video’ and ‘Common Video’, we find the added ‘H.265′ there. Firstly for encoding our H.265 videos, select the ‘HD Video’-> ‘H.265 HD Video (*mp4))’ for an usual selection. Yes, three standards of H.264 codec types you can choose well. 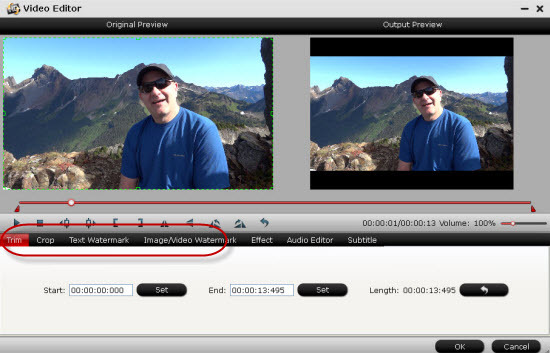 While for decoding H.265/HEVC videos, just go to the ‘HD Video’ to make the ‘H.264 HD Video (*mp4)’ as your best one. There are still some popular functional items we can take around on the main interface, for example, in the ‘Edit’ button, we have offered you the ‘Trim’ to decide the video length, ‘Crop’ to remove the unwanted edges, ‘Subtitles’ to add some extra explanations? More you can have a try here. Now hit on the “Convert” button on software main interface to start the conversion. As an High Efficiency Video Codec Video Converter, Any Video Converter Ultimate will be a great helper to convert any video format including AVI, MP4, MOV, MPEG, 3GP, ASF, FLV etc to H.265 videos . Let’s learn how it works. Step 1. Free download and install this HEVC video converter, then run it. 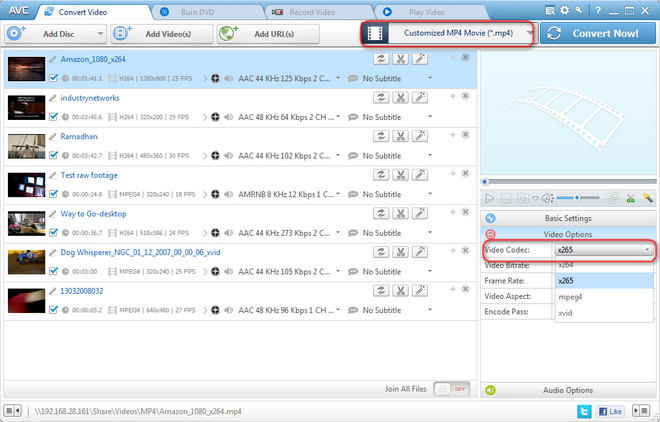 Step 2: Add the videos you need to HEVC Converter. 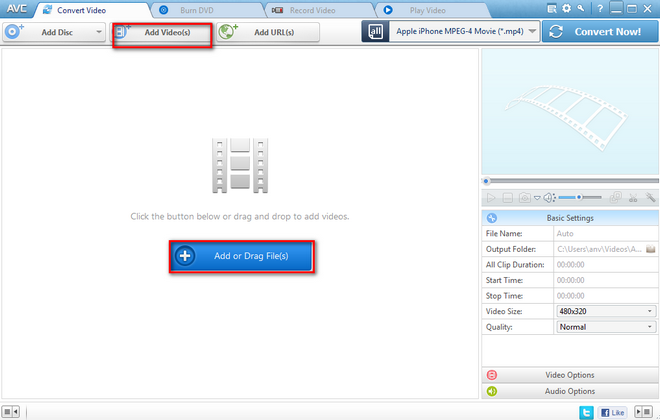 Simply click “Add Videos” or “Add or Drag Files” to add the videos you would like to convert to H.265 format. Note: Batch video conversion and merging videos are also supported. To successfully convert any video files to H.265, you just have to select the format you want, let’s say, MP4 (since it’s the best file that goes with Apple devices.) you can do this by selecting the format icon in “Output Profile” drop-down format list, simply choose ‘*.MP4’ in the Format tab and then select “x.265” as video Codec underVideo Option. Step 4. Start converting videos to H.265 format. Just click Convert Now button to start converting videos to h.265 files. Once the conversion is completed, you can click “Output Folder” button to get the converted videos. Wondershare Video Converter Ultimate is a swift, easy and adaptable digital video converter, DVD burner and converter for Win. It allows you to convert any videos or DVDs from one format to another with lightning-fast conversion speed. Additional Features: Edit tool videos, can burn video into DVD, get videos from video sharing websites, and etc. You have two different ways to do this, first is by going to ‘Convert’ tab, then choosing ‘Add Files’, a file folder will pop up and from there you can browse and choose the file you want to convert. The second and simpler way to do this is by opening the folder containing the file you want to convert and simply dragging it from the folder then dropping it on the pane of the video converter software. In order to convert any files to H.265, you just have to select the format you want your file to be converted to, let’s say, MP4 (since it’s the best file that goes with Apple devices.) you can do this by choosing the format icon in “Output Format” pane to see the drop-down format available in the software, choose ‘MP4’ in the Format tab you can see from the Video category, and then select ‘H.265’ as video Encoder by going to the Settings option. If you want to convert a H.265 file format into another format, simply choose what format you want your file or files to be converted to. Simply click “Convert” button in the bottom part of the video converter software window and the conversion will then begin. Wait until it’s done, the speed of completion always depends on how big or how many your files are. On Windows 10, you can natively play HEVC videos in the default Films & TV app or through Windows Media Player. Alternatively, you can use VLC or MPC-HC for playback, which support older operating systems, or popular media center apps like Kodi (version 14 onwards) and Plex Media Player. On macOS or iOS, VLC is your best bet. On Android devices, you’ll be able to play back HEVC files using MX Player through software decoding if your device is fast enough, or if it is, both MX Player and the Plex app supports native HEVC playback. Note that some devices have HEVC decoding blocks in their SoCs but don’t support native playback at this time. Learn More: Where You Need H.265? An HD video is usually very large in size, in order to save space while remain the video quality, converting the HD video to an H.265 video is the perfect solution. Result is the image quality is the same, but the file size is reduced to half. Cheers! If you want to view a DVD or Blu-ray movie on your video player devices, you need to convert the movie to a specific video at first. Here you can use H.265 codec to get a video with high video quality and relatively smaller size. If you have many regular videos in other formats, you can also convert them to H.265 videos and you can get much better video quality, and the file size is not large. Isn’t cool? Note: If you buy Pavtube Video Converter Ultimate now, you can get it at a 20% discount cause Pavtube Studio is holding on Year-End & Christmas Sale. Learn the details here .